This guide, in its current form, can be found here but it will be transformed back in to its original form because this is much easier to maintain and update. 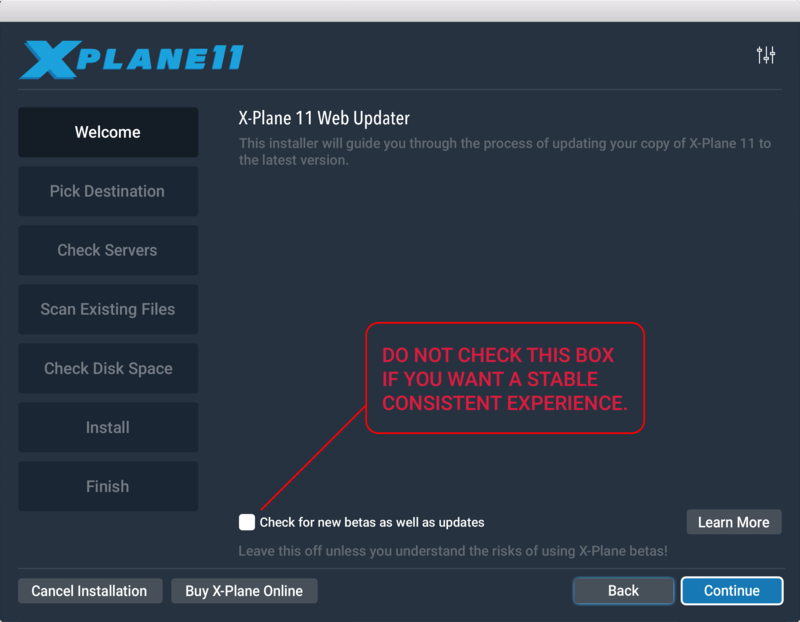 STEAM makes X-Plane dependent on its own file structure and you will need a workaround to be able to make one or more working copies of X-Plane somewhere else or on another disk. This is useful when you want to add content and start messing with the file structure. Or want to opt in on the beta. You will of course still be able to make a backup through STEAM as usual (Steam menu > Backup and Restore settings) And this is highly recommended if you start messing with addons. Direct Download (OR DVD purchase) gives you the option to make as many copies as you want of X-Plane to mess, mod and tweak with. It must be on the same computer or you will need multiple licenses. You will be supporting LR as much as you can and not give 30% or more of the amount paid to STEAM (this effect goes double at steam sales). LR is not a big company and we all benefit from their usage of available resources. So bottom line: we recommend Direct Purchase. NOTE: Threshold store does also offer X-Plane. If you want to support us and still give a large margin to Laminar you can find it here. Do check the Minimum Requirements for X-Plane. One rule of thumb is: the more addons and the more complex addons you want to install, the beefier system you will need. If you still are uncertain, we suggest you to download the demo and test it if it works as you intended on your system. Yes, many of your addons will work in XP11. But you might want to revisit that particular addon's website to clarify if there has been an XP11 update for it or if one is needed. 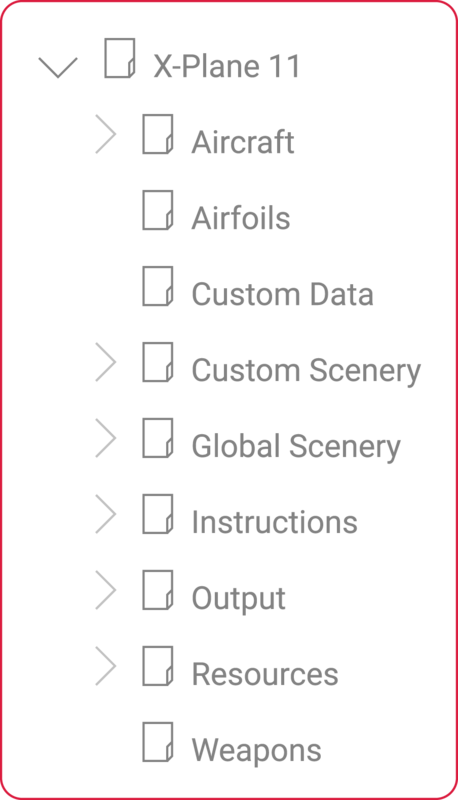 Do NOT copy/paste your entire custom scenery folder, your plugins folder or your aircraft folder! Trouble and Headaches will ensue. If you do copy stuff over from your XP10 install, then copy one by one and test them. There is a program that developers use called X-Reloaded. With this plugin, you can reload x-plane without having to restart it. In general scenery addons do work well in XP11, airplanes get a maybe (if they don't require an installer) and plugins are questionable. Rule of thumb: the more complex the addon, the less likely it will just let itself copy over. The drive is almost always your system disk and installation on this disk should be avoided if possible. No harm in installing here, but make two top folders for X-Plane on a separate disk. 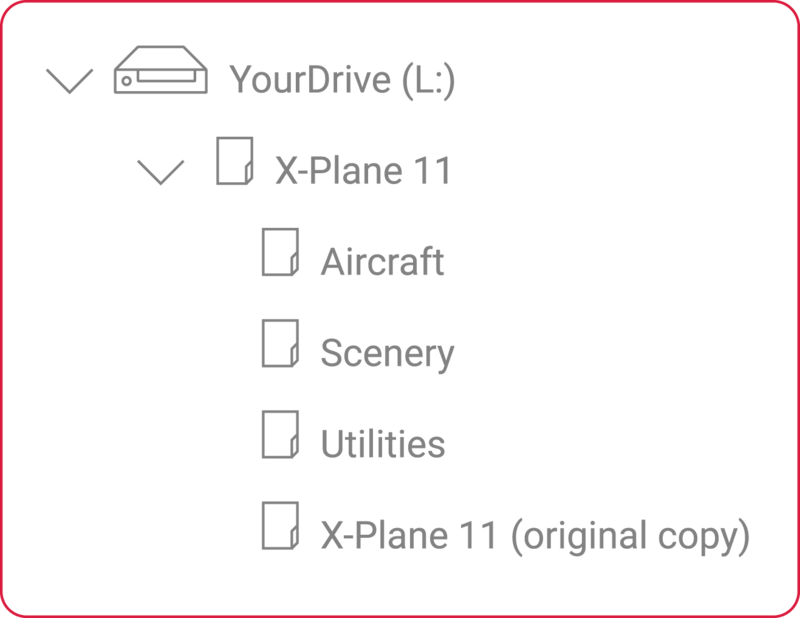 One is the X-Plane install and the other is for the downloaded storage of your X-Plane add on files (how to install aircraft and scenery to X-plane is described further down). Installing X-Plane on a SSD gives you NO performance advantage other than loading times. You can have parts of your X-Plane file structure on another disk, even an external or a network drive, (but that is not for beginners and we won't divulge into that here). For a good tutorial on how to set up your simulator after install, check out Stealthbob's video post of Catstrator's tutorial here. Do NOT opt-in on the beta releases unless you really know what you are doing. Beta releases are there to be tested if the version to be released next is stable or not. Names usually follow this convention: "11.XXb2" The beta then goes to "release candidate" versions, they are still considered unstable. Their names are usually something like 11.01r1 or 11.01rc2 and so on. If you are a normal user – just ignore beta. Be aware that the more mods you install, the more resources your simulator will demand from your computer. That does not mean that every mod will crunch your fps, there are even addons that will have no effect or even improves FPS while enhancing your simulator at the same time. Be sure to check the minimum requirements of the addon you choose to install. Never install more than one addon at a time and take your time researching the addon you are installing. Check that your installed addon works before installing the next. Many addons do NOT work well with others. Also, check if the addon is XP11 compatible. Many XP10 or even XP9 addons work out of the box in XP11 – but if the developer does not give guarantees for it – do not expect it to work in XP11. Rule of thumb: the more complicated; the more you need that guarantee. If you plan to add tons of addons. Make a copy of the original installation of XP11 and put it in a vault where it is not touched. Get to know the folder layout in XP if you start with modifications. Some addons install themselves with an installer (most payware do) but more often than not you will have to install your newly acquired mods manually. You need to create a new subfolder and call it whatever you want, such as "My Hangar", from there on- any downloaded aircraft should be placed in that folder you've just created. Do not place it directly inside the Aircraft folder as X-Plane needs a subfolder to categorise the Developer. If you have copied your new aircraft to the Extra Aircraft folder, then you will have to tick the box for extra aircraft in X-Plane or it will not show up in x-plane's aircraft page. The X-Plane11/Custom Scenery folder is where you move your extracted airports and scenery folders. Be sure to follow your content creator’s instructions! Some addons need special treatment and there is almost always a readme file with instructions in the unpacked folder.The X-Plane11/Resources/plugins folder is where your plugins go. If you run out of space on your HDD and need to add another you may want to look at this guide below. If you follow this guide then everything will look and function just like normal only the location of your custom scenery folder is on another disc. One of the best Airliner simulation you'll find on any simulator is the IXEG 737 classic. You'll also have the Flightfactor 757, 767 witch are good and the LES SAAB340, which is another highlight in X-Plane as one of the best turboprop available. There are tons of other great Airliners out there so don’t hesitate to ask for other peoples favorites. Same goes for all other aircraft, turboprops, GA, gliders, micro or military. If you don't have the money for the IXEG (you should save up for it if you like 737's..) then there are mods to enhance the default 737-800 - called ZIBO mod. And many others.. Search for it Last but not least: Liveries. Tons of liveries all over the .org and the Threshold forum as well for just about every freeware or payware aircraft. If you want high quality liveries, check out Cessnarox. XPlane has a “feature” called X-portal where content creators can add their creations and maybe get them in on the next XPlane update. This database and thus XP’s default airport database is growing fast. But there will always be airports missing. Just search the .org for the airport near you or where you want to fly. Search by name or ICAO code.You will most likely find it in the .org. Just be aware that big complex airports get system demanding pretty fast. So your 486 with 75Mhz turbo boost might struggle here even with the button firmly pressed. Where as aircraft are usually straight forward, airports will often have to be manually put in the right order in the scenery_packs.ini file. Not that hard to do but must be done for the scenery to load correctly. First: drag the airport into the Custom Scenery folder. Start XP (this is for XP to recognize the new content). Close XP again and just open the scenery_packs.ini from your custom scenery folder with notepad or a text editor of your choice (I use notepad++). In that list you will now find the new scenery. Cut it out and paste it in where it should be located. (Airports on top) If you are unsure where your scenery goes, check the link under the warning tag below Ortho4xp section. You can easily work in the Custom Scenery folder rather than in the .ini file if you wish to. You can rename all your sceneries so that they are in alphabetical order and in the order required by XP. Just delete the .ini file whenever you add new scenery and X-Plane will create a new one with the alphabetically ordered folder names on next start. But do not rename Libraries (!) as this WILL lead to errors. You will not be freed of editing the .ini file in this regard since when adding new libraries and such, you will have to check that they are in the right loading order. You can order your airports as you like, by country, then by ICAO code, then by name. If you want to start making your own scenery the tool to use is called World editor or WED. (A good tutorial) ----> this is not a part of what beginners should start off with. I just wanted to mention it for those who might be interested and if you have had some experience with computers it is not that hard. Want to try making scenery for x-plane? Bill Womack from iBlueYonder has made a VERY comprehensive introduction to it all. Read all of it here. WARNING! Once you share work where you have used ortho4xplane or other scenery photos from sources that you have no agreement with, you are risking a heavy lawsuit from the provider. The other problem with this is that you risk closing off this access to free personal usage of areal photos for everyone. Once you throw in a donation request or charge money for it, this goes double. That there are many scenery developers that have ignored or are ignorant towards this problem among the available sceneries in the.org or elsewhere is not an excuse to commence sharing such projects and it is still considered piracy. City single objects, certain buildings, bridges, statues, etc. I can't recommend this program enough. It organizes and keeps your x-plane folder tidy. It has a good amount of functionality and is a very useful tool to keep your head on top of what you have installed. A great tool and there is a reason I mention this one first .Pro tip: I use xOrganizer to choose between non compatible addons such as Skymaxx and xEnviro. You only need to do this once to change what you want X-Plane to load and you can then start XP normally through the XP shortcut. This is a fantastic tool that adds an instructor in to your cockpit that keeps you on your toes to do everything by the book. This is a great tool for beginners, students and seasoned pilots to learn and keep skills within almost every aspect of flight. If you want photorealism - then check it out (you will hear a LOT about that program here and everywhere. Ortho4xplane is a program that generates photorealistic tiles of your chosen area (if there are providers for it). It covers most of the world but be aware that this addon gets space consuming fast! W2XP is something you will hear about in the same breath as ortho4xplane. It adds autogen based on OMS data. Works great with Ortho but is not an absolute must. It replaces the default autogen. HDMesh is the last one in this scenery galore trio. It is the “heightmap” of the downloaded area. Ever seen those stunning Xplane pics from the Alps (LOWI and such)? Yeah, that’s probably made with these three buggers. Seasons for X-Plane! March 2018 marks a change in X-Plane history. While we have had ortho-tiles converters and attempts on seasonal packages before; this one stands out as one complete package that does not require a science degree to get to work. (It does not work with ortho4xp tiles, but you can easily switch between them in xOrganizer) Head over to MaxxXP to read more about this plugin. This is an alternative to ortho4xp. The difference being that this is a plugin that starts with X-Plane and it generates tiles per position of the aircraft. It might be an easier way of getting photo realistic scenery, but ortho4xp is better if you want to create large areas fast. This addon will give you total control over camera views (a bit daunting at first glance maybe - but well worth it! )This is a MUST HAVE if you use track ir. Setting the boundaries of movement in x-camera makes all the difference when trying to keep your head in the cockpit. 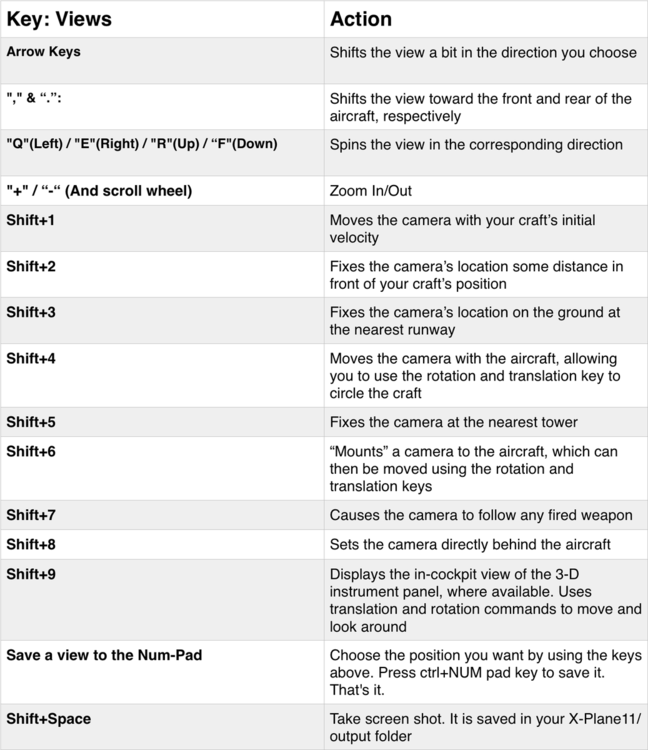 For Your Information: Use the arrow keys to move left/right, or up/down and period' and 'comma' keys to move forward and backwards (Keys over right ALT key) Use ctrl + NUMpad Keys to save camera angles. More on this under keyboard shortcuts further down. For more control than what default gives you: use x-camera. If you like flying in 3rd person or outside view, scenic flyer adds a basic instruments panel to your screen. If you want to throw in some economic aspect and "play career mode". This too may seem a bit daunting at first and it is in essence web-based with a small plugin for XP itself. So don't expect a full blown transport tycoon like experience or a fancy GUI. But once you are in and get the basics: Definitely worth a go! I have not tried these yet myself since I find them daunting (get a grip!) But I hope I will get my nerves together in the future to get over my initial fears. What is it you ask? Oh, sorry – it’s online live ATC for your inter-humanistic communicational needs. You actually talk to a human who plays the role as ATC. I need to be corrected on what I write about these since I am a total noob. 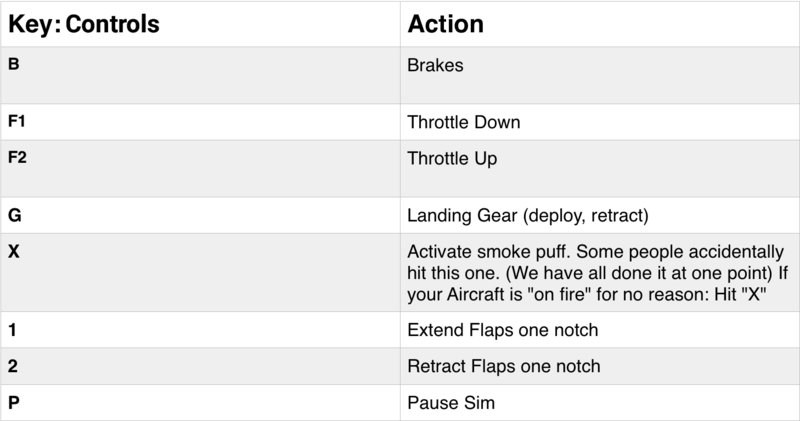 If you decide to take the plunge into this side of flight simming, then this script might help you along. FYI: List is non-exhaustive. Ask and it is probably made, being made or someone here will take an interest in making it. And as you can see there are no addons that go under the full geek difficulty. Make a copy of your X-Plane folder today and start expanding your X-Plane! Remember that the X-Plane community, although growing extremely fast since the launch of XP11, is still small compared to FlightsimX and Lockheed Prepar3D. The backside of having such a small crowd is that the major developers don't see profit and therefor hesitate to start large projects. Plus side is that the community is a tight one and that it is a very friendly and welcoming atmosphere. Smaller developers now also have a chance to get bigger and maybe compete with the "big boys" like PMDG from FSX nad P3D down the line. Orbx has released a handful of sceneries already and have announced that we can expect more in the time to come, so things are happening. With X-Plane11.20, X-Plane users have access to Native VR. Before, and in non-beta versions VR enthusiasts had to use a program called Flyinside (for x-plane, p3d and fsx - separate versions). Now VR is coming natively and although it still has some bugs and is system demanding, it looks beautiful and it will give you a completely new experience in X-Plane. Performance is LR's top priority until VR is good to go. When STEAM is downloaded search for steam VR in STEAM and download it - it's all free. If you find bugs, then please report them to the proper authorities (link). Being, of course Laminar Research. Do not to use if you actually plan to report bugs to LR! Keep in mind that this fixes things just temporarily (mostly). There's no guarantee that it won’t break your install (remember that I mentioned to back up XP before messing with this?) 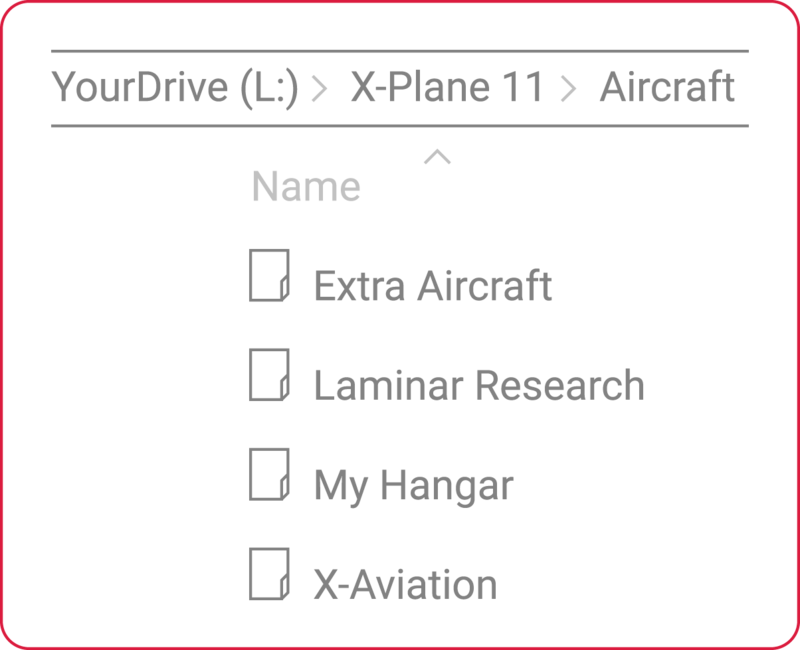 Anyways – here it goes: Delete the x-plane.prf file in your X-Plane11/Output/Preferences folder. You may see increase in FPS as a result of this but only use this as a last resolve. And don’t come crying to me if something happened or something did not get fixed. I think I have warned you enough now. What causes low FPS in X-Plane? Many factors can be taken into account, depending on your computer specifications, your OS and what programs and background tasks you have running, your in-sim graphics settings, where you fly and the plane you have chosen. There is a huge difference between Large Cities or large airports and starting on a small airfield in remote areas. Also, the difference between any given aircraft is very relevant. But its complexity is not necessarily a big factor. It depends on how well the aircraft is made. You'll have checked that you do not have unnecessary programs running in the background.What can you expect? There is no precise answer to this but you can get a feel for how it should be. Go to a small and remote airport and load the default Cessna on medium to high settings (Not all of the sliders all the way to the right but on that side of the middle - you will have to test this yourself). You should at least get between 30 and 45 FPS. Maybe up to 50-60 FPS in external view. But notice that when you look at high-resolution textures in the VC cockpit you can get as low as 20...Everything under 20 FPS, in general, is considered too low with the specifications mentioned above. For lower spec PC's try to lower your settings. Start at the bottom and work your way up to an acceptable compromise. A simulator is a slow moving thing and you do not need 60FPS to get a flowing experience. Everything above 25FPS is enough for airliners and you only need more than 30-35FPS if you fly Jets or acrobatics. Until XP11.1 releases with a performance upgrade you really should reconsider if you are chasing high FPS numbers. These are only my thoughts on the matter, and people tend to have a strong opinion on what good FPS is for them. Especially if they come from fast paced first person shooter games where you need all the fps you can get. When we talk VR, it is a whole new ballgame and Laminar Research is aiming for VR readiness in the 11.1 update which will benefit everyone since VR is very FPS demanding. So all you see is water? The easy fix won't fix this one... But it is still easy! Just open the installer (in your X-Plane root folder) and install the scenery. Yup, that's it. Be aware that the whole world will eat up a lot of space, so start with your local area or where you want to fly and expand from there. Often it is not the downloaded folder that goes into the Aircraft or Custom Scenery folders but a folder within the downloaded folder. This is not an error, but just a thing that has to be done on many aircraft as they do not contain the icon in its file systems. 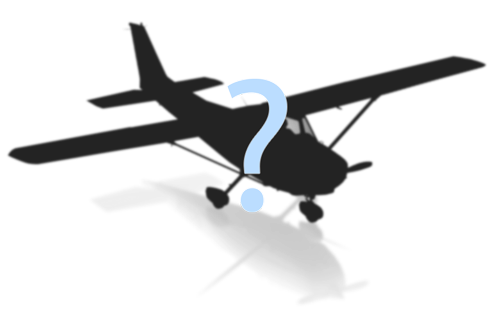 X-Plane will generate one for you, and this is how: Start a flight with the plane you wish to generate an icon for. When X-Plane has loaded, go to Flight > Flight Configuration. How to fix: Go to "customize" on the loaded aircraft and now you will find a "Generate Icons" button. Press it and voila. Your sim will probably enter windowed mode and if it seems stuck you most likely have paused your sim. Not every aircraft will show these icons correctly some will be over exposed and bright, others will turn out as miniature planes like the ones from the "kids on flight packages" that you got as a kid from some companies. Search the forums if there is a fix for your airplane. Want to keep up with the X-Plane news? Use these RSS links for anything from Discord bots to online RSS readers. If you want to follow closely what is next in line for X-plane, you can follow the developers blogs. Knowing Austin Meyer is knowing X-plane.